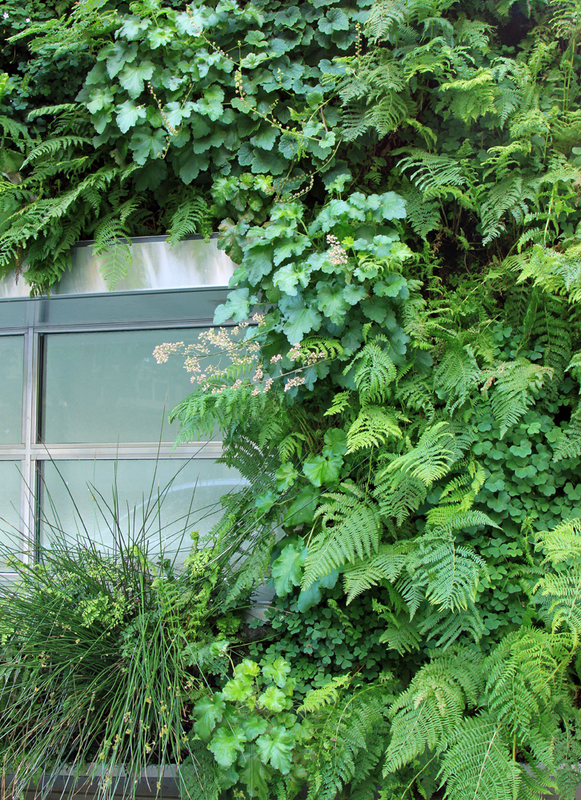 It’s four years since Patrick Blanc installed the vertical garden at the Drew School. I’ve been curious how it was doing. I was hugely impressed when I saw it, even though it was late fall and the plants were getting cut back for the winter. I always intended to check back on it, see how it would endure over time. As you can see, it’s doing great. 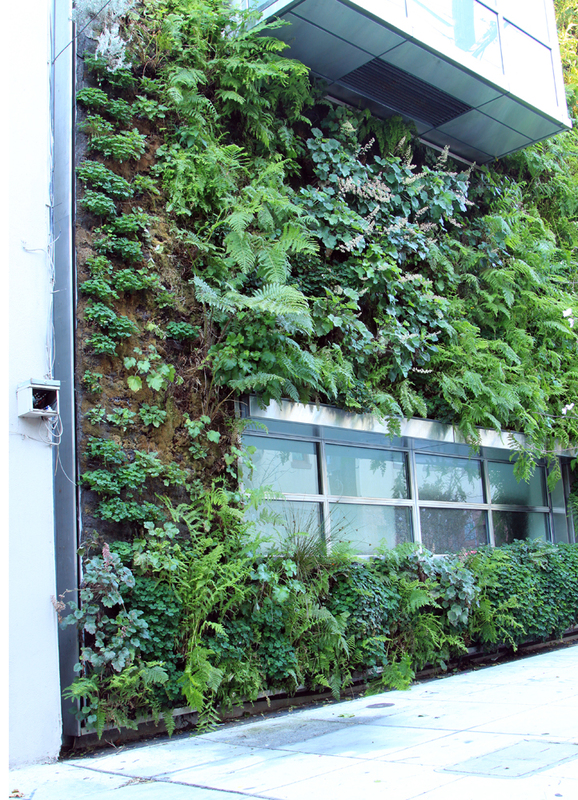 It’s lush and green; it’s not organized into as much of a tapestry as some of his other walls and it’s not particularly full of springtime flowers, but it’s still a dramatic, exuberant, awesome thing to see on the side of a building. The planting has simplified over time, with fewer species. 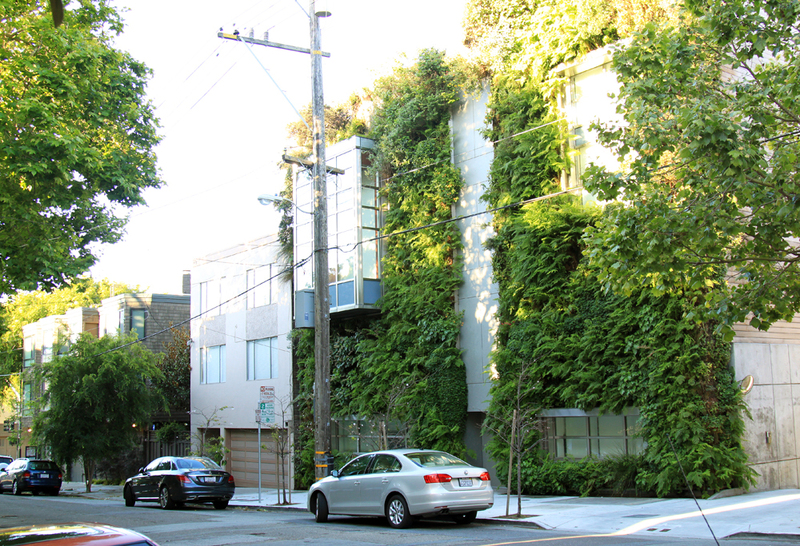 Lower sections are mostly covered by ferns, with patches of oxalis and heuchera. I couldn’t tell exactly what’s growing up top, except for an Island Bush Poppy in bloom, but some of the shrubs have grown quite large. A couple of sections are patchy, with felt showing, but it doesn’t ruin the overall effect. And so much of it is exuberantly lush and green. It’s great to see natives filling the side of a building. This entry was posted on Friday, May 1st, 2015 at 6:48 am and is filed under california natives, plants. You can follow any responses to this entry through the RSS 2.0 feed. You can leave a response, or trackback from your own site. That’s so impressive, especially having it in CA! 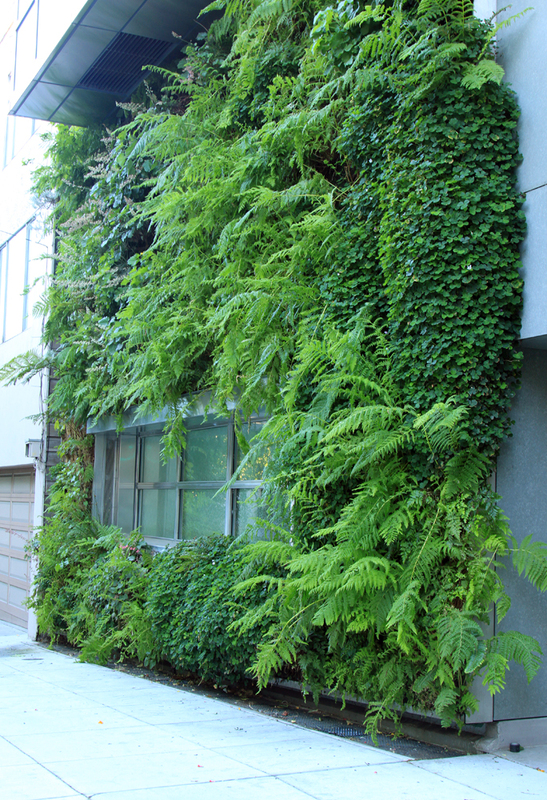 I saw several green wall projects in Portland a little while ago, but that was Oregon… Wonder how much water this gets. The irrigation recirculates like an enormous water feature, but that’s as much as I know. I’m curious how much water it uses. I heard water trickling down behind the plants while I was there. This is is so awesome! This is truly a creative idea. I need to incorporate that into some of my designs.